The design of a company’s headquarters should always be carefully considered: the building is supposed to be representative of and reflect a company’s position within its field, without being flashy or pretentious. A fine balance has to be struck between these ideas. 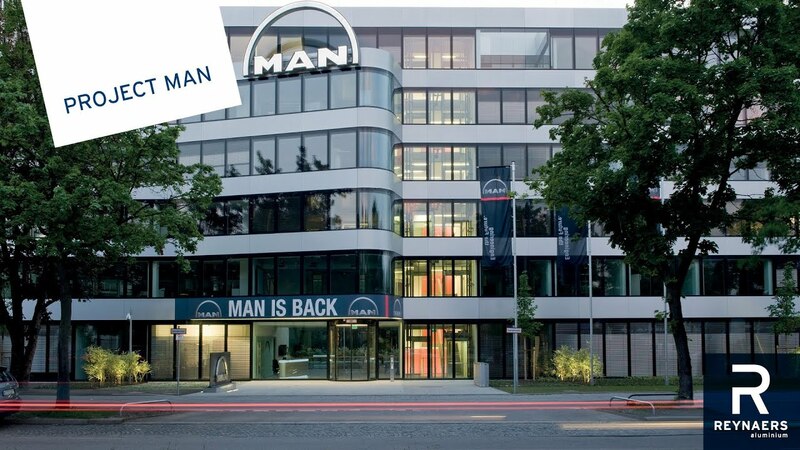 This intention has been successfully realized in the new headquarters building for the MAN Group in North Munich, completed in 2009 and now employing over 170 people. The architecture for the internationally renowned industrial company in the transport-related engineering sector was designed as an elegant understatement. The six-storey office complex on the Ungerer Strasse, a busy arterial road in Munich, is only partly new. The building’s north wing dates back to the early 1980s and was still occupied by traditional individual offices. But conversion and extension have not been interpreted by the architects as a dialogue between old and new – instead they now form a single unit. The company’s management headquarters have a coherent look, both inside and outside, which chimes in well with MAN’s corporate identity. The conversion and new construction to the south were designed to form part of an office landscape which is as open as possible, flooded with light and fully in harmony with how we communicate at work in the 21st century. Daylight control is enhanced by reflective retaining walls, perforated aluminium sheets on the ceilings, and glass internal walls. In this way the architects were able to create good light conditions and a close relationship with the outdoor space, despite a building depth of seven to eight meters. On the outside, the main building shows dignified restraint with an outfit that seems to have been inspired purely by technology. The building corners are rounded on all sides, while continuous ribbon windows and aluminium panels emphasise its horizontal dimensions. The flush surface created by the windows and panels gives the building’s skin a sleek, smooth and even silk-like appearance in certain lights. That the aluminium panels shine differently according to the light conditions is due to the finishing processes applied to the surfaces, which were ground longitudinally before being anodised, so that the aluminium looks like finely finished stainless steel. The ribbon windows were designed as a double façade with integrated sun protection. Individual windows can be opened, if required, using sophisticated, subtle technology boasting special fittings from Reynaers. The 300 kg parallel opening windows are electrically powered and can be pushed up to 30 cm from the façade surface. The durability of the mechanism was proven with a test operation of 33,000 cycles. In terms of sound protection, these parallel opening windows are more efficient than turn/tilt variants, mainly because of the double glazed façade that also creates an enhancement of the natural ventilation. For insulation the skeleton strips of the CS 86-HI system were used contributing considerably to the energy efficiency of the building. Sun protection blades are fitted between two panes and can be adjusted to different heights, which enables an effective distinction to be made between sun protection and daylight control. The executive floor presented a special challenge. Spherically curved corner elements were developed, from which inclined sash windows lead through to the terrace. Overall, MAN has gained a Corporate Center which fits like a tailor-made suit, with a classic cut and high quality fabric.